I know you must be thinking why would anyone want to make garbanzo beans when you can buy them at the store. You can grab a can or buy beans and cook them. Well, that is what my husband asked me. 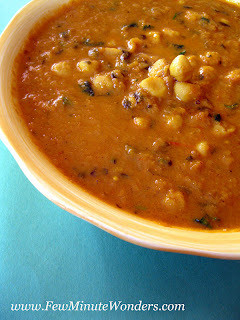 I started to give reasons: firstly, maybe you can make chole in a jiffy without having the beans at home. Secondly, it might be economical to make the beans with a cup of besan flour. 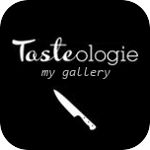 Thirdly, just for fun to think outside the box and experiment with food. He was not convinced with my answers. I still decided to make chole and test out the recipe that Vanaja Athai gave me when I last visited India. She learnt that I blogged and pulled me over to the side and told me in her soft voice that she often makes channa for chole and asked me to try out this recipe. Today, I decided to test it out. 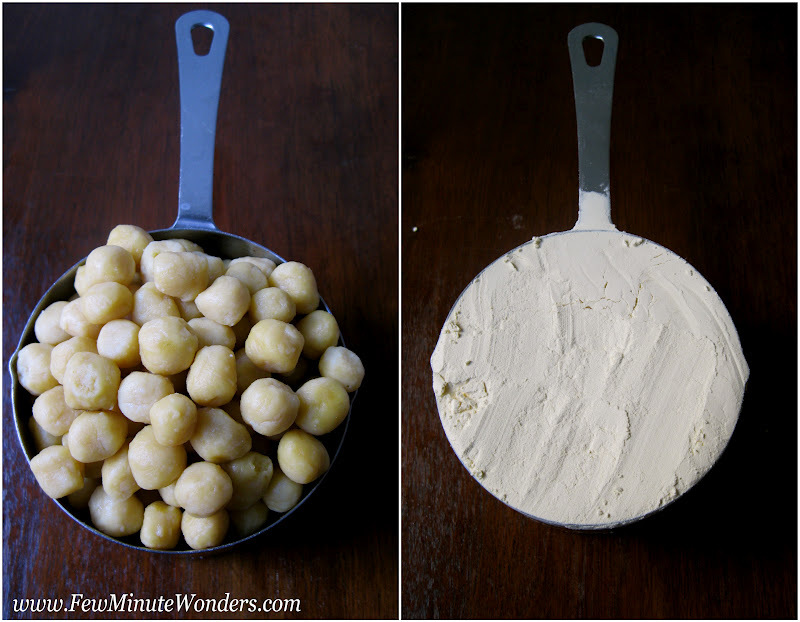 The preparation was very simple, straight forward and can get the kids involved in making the channa balls. Now,was it worth all the effort? The opinions were mixed. My daughter and I thought it was pretty good and it tasted better the next day, but not a perfect substitute. My husband on the other hand said he would rather have the beans in the chole. But either way, I had fun making it and documenting it here. My entry to Vardhini's events: "Healthy Diet - Vegetarian Side Dishes" and Love Lock Series - Legumes Event . Note: I just made the basic recipe, maybe if we add salt and spice to it, it might taste even better. 1. Place a saucepan on heat with 3 cups of water in it and allow for it to come to a rolling boil. 2. In a bowl add besan and water and make a dough. 3. Rub your hands with some oil and roll out the dough into thick ropes. 4. 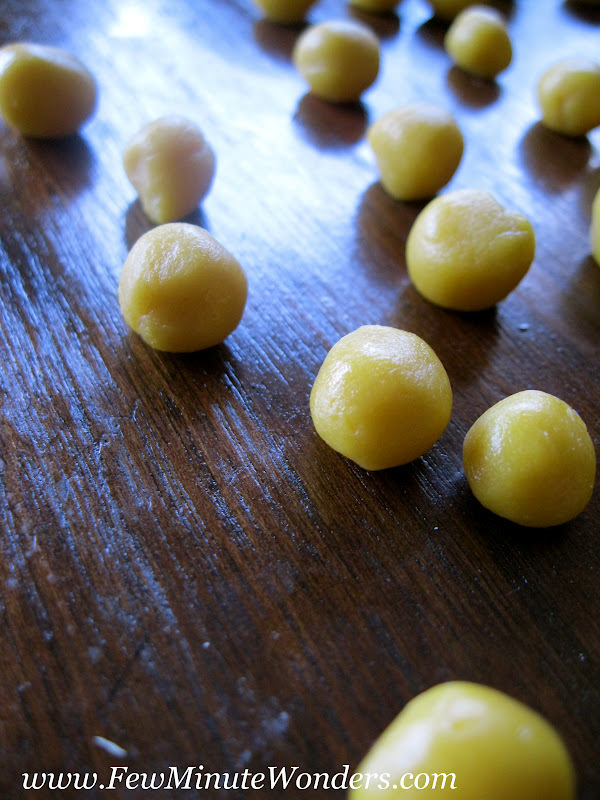 Cut the ropes evenly and make small balls to resemble garbanzo bean. 5. 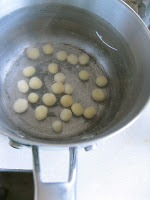 Add the besan balls to the boiling water and boil for a few minutes until the mustard color of the beasan turns to pail yellow. ( About 4-5 Minutes). 6. Drain the water and add the cooked besan balls to the any basic chole sauce. Pressure cook it to 3 whistles on medium heat. looks fabulous..very interesting recipe..will try this!! 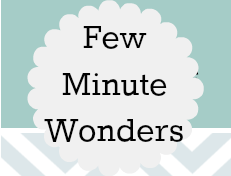 I was little confused at the title, this is very interesting..
Omg, wat an excellent idea of making our own chole, thanks for sharing;..
wonderful innovation, it's a must try, nicely explained recipe and snaps to match it, well done! Innovative n delicious recipe,never thought of doing this way n they look like perfect chana!! This is how the maharashtrian gatta is made. They make subzi out of it. I would rather go buy the canned ones if I need it. This takes longer than that. wow, so innovative, they have come out so perfect and excellent idea dear..
Looks like I am making a whole bunch of Maharashtrain food without a clue that I making it. Great idea dear !! perfectly done !! Oh my .. I first thought they were the actual garbanzo beans. Perfectly done and thx for linking to the event. This is so awesome! Looks so cute and great! Thanks a bunch for sharing! Great idea.. 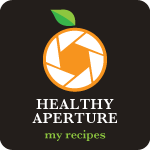 Very innovative and delicious recipe. Wow! That's such an innovative idea and the balls do look like the beans.Drop by my blog sometime..